Fruit Sushi! So Amazing you will be speechless ! yes I am sharing another recipe by Youtube Gemma stafford!! I found this recipe on her lovely channel ” Bigger Bolder Baking” She does not focus on Vegan desserts all the time, but she has some fantastic recipes that I absolutely adore and keep making! If you have not yet please check out her channel HERE! Fruit Mango, pineapple, kiwi, strawberry, raspberries. 1. In a heavy bottomed saucepan combine the rice, 2 cups water, 2 tablespoons sugar, salt. Bring to a simmer, then turn the heat down low and cook gently for 12-15 minutes. 5. Spread out a rectangle of rice. While spreading out the rice it helps to have a little bowl of water to dip your hands in and help the sticky rice spread. Lay your sliced fruit on the rice around ⅔ the way up the rice. Start to roll, use the cling wrap to control the roll and keep it tight. Take your time. Once your sushi is made roll it on its seem so if doesn’t unravel. 6. Change it up and lay down mango on the cling wrap, then lay down rice directly on it. Fill with fruit and roll up. 7. Also you can toss a roll in toasted coconut which works really well with the fruit. 8. Mix it up and get creative, this can be a really fun recipe where everyone can participate. 9. Serve your sushi with sliced cantaloupe for the ginger and fruit puree for the dipping sauce. Previous **Nature’s Gate** Acai Body Lotion, Cruelty-free & Vegan! Next AUBREY Every Day Basics Moisturizer, My Honest Review. sure will 🙂 and thank you! Does rice and fruits taste good together?? You add sugar to this rice 🙂 so it is really delicious 🙂 have you had mango sticky rice ? if yes, its kinda like that, but with more fruit variety! its awesome! Is it like shirberange or sholezard with fruits? 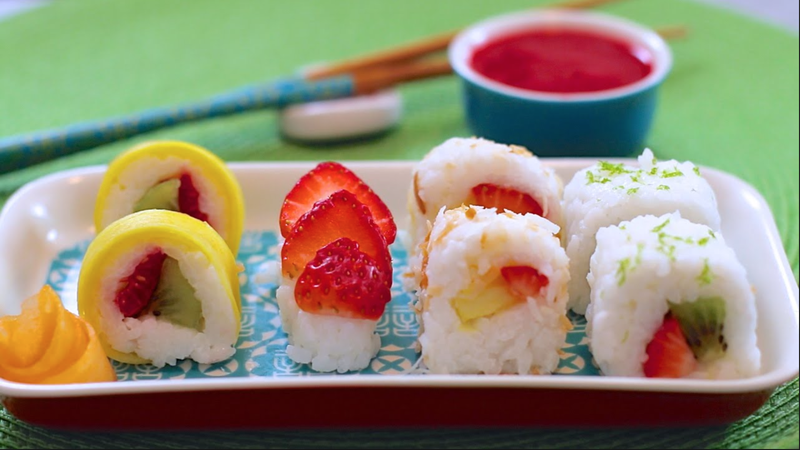 yeah kinda like shirbereng… but with fruit 🙂 not so much like sholezard although you might be able to add rose water in there there with these sushi rolls and it would be great!!! This is such a wonderful idea, and looks beautiful too! thank you!!! and likewise:D looking forward to your posts as well! What a great idea…I don’t eat fish, but I would eat these…..thanks but yet again for the great ideas…. WOW! This looks amazing and it looks like my kids would eat it. Do you have any great recipes for high protein breakfasts that kids will eat? We are transitioning to vegan breakfasts and my 7&8 year old have hard a hard time with the switch over. Thank you! I tried the shakes with my kids but they still want to “eat” something. A 1/2 a shake and pancakes sounds yummy! Yum!! I am going to try this. Thanks for sharing!! This is an excellent Meatless Monday recipe that I can wait to try myself. I love sushi and fruit. Fruit Sushi… Brilliant!! !